Today I am especially excited to bring on our special guest, Coach Kevin Duffy. Are you making the most out of this off-season? Some of the most common problems golfers experience on the course when the season comes around are lack of distance, lack of endurance, and not being any better and, if anything, being a little rusty from the year before. Physically, you have to try and balance keeping up with your workouts while making sure you’re not too sore on the links or vice versa. 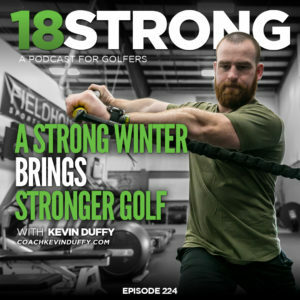 In this episode we dive into “The Strength Window” in the off-season to get you prepared for the workouts when the season comes up and if you listened to “Episode 221: 5 Non-Golf Things You Should Do This Winter”, than this episode with Rotational-Specific Strength and Conditioning Coach Kevin Duffy will be the perfect follow up. Kevin Duffy is a Certified Strength and Conditioning Specialist (CSCS) based out of Sudbury, MA. Known as ‘Coach Duff’, Kevin has a vast amount of experience with training athletes of all levels and he is specifically experienced in Golf and Rotational specific work. His background as Coach Kevin Duffy in the public and private sectors, and how he branched into the golf world through TPI and his rotational work. Deadlift: The deadlift and the hip-hinge are what help puts you over the ball. Once you get over the ball, you want to feel strong over it, which the deadlift helps with while promoting good posture. Farm Walk: Maintaining a movement and posture while reigning in the spine rotation. Pull-up: Another posture builder, the pull-up sets can help not only with strength conditioning for the new season, but with shoulder strength, stability and confidence. Step-Up: Simple endurance workouts, which can condition you for the upcoming season and carry over into the seasonal power and speed exercises. How he programs these 4 exercises with his clients in the off-season and how it’s about variation and simplicity over trying to over-complicate. It’s always better to do something simple consistently rather than overcomplicate and get lost in the process. He breaks down his famous “door-kick” call sign on each of his videos. Who has been instrumental in becoming the Coach you are today? Jason Glass and his “gut check” moments that have helped in my growth and keeping me in line with knowing how to grow. Any last piece of advice for the 18Strong Community? Get after it and enjoy the chase!